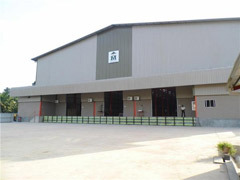 Mercantile Produce Brokers (Pvt) Ltd, a tea brokering company active at the Colombo Tea Auction opened a state-of-the-art warehouse complex at Enderamulla, Wattala. It was opened by Chairman Sunil Udalagama recently. The warehouse complex is fully automated with high-tech warehousing systems, with minimum human handling. At any given time 10 containers could be loaded and unloaded simultaneously.The storage and handling solution was provided by United Tractor and Equipment (Pvt) Ltd. The teas that are unloaded on to pallets at the unloading bay are moved into the stores by high-tech forklifts. The teas are stacked on racks upto 11 metres in height. The storage capacity is four million kilos and the warehouse complex uses minimum electricity from the main grid and ample day light. Construction work was completed by International Building Systems Factor Lanka (Pvt) Ltd.